It is believed that hydro excavation started in the mid 1800’s. This is when the miners in California used steam pump-pressurized water to wear away land masses. They do this to capture the gold and other minerals easily. The process that they used was then referred to as Hydraulic Mining. As time passed, technology got better and people invented a more competitive machine for excavation. The first hydro excavation services machine called the “ExcaVactor” was built in 1969. In 1970 and 1980, vacuum trucks and sewer cleaners were adapted by the public for hydro excavation use. Some people removed the vacuums from these vehicles and put them on all-terrain types of vehicles in order to get to remote locations more easily. In the year 1990, a lot of companies began to manufacture trailer-mounted units and trucks in different configurations to satisfy the growing demand of the market for hydro excavation machines. Today, hydro excavation is being used widely by a lot of people across Canada and the United States. 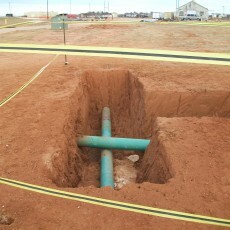 More and more companies are offering the hydro excavation service. Over the coming years we expect to see further improvements that create even better, easier and faster systems of hydro excavation. We predict that this trend will continue to grow.